In this beginners guide to Homefront: The Revolution, you experience what skills can be useful to you at the beginning and which bases in terms of tactics and behaviors you should apply at the beginning. 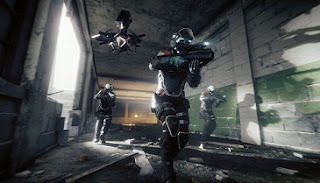 - Looting: To snag prey is one of the main approaches to Homefront: The Revolution. Therefore, never forget to loot from defeated opponents. Also keep your eyes open when you move into the game world. There is always you can find craft materials or diary entries, including Trophy. - Armory scour: You have also the possibility of weapons in the armory to buy if you do not have so much desire to crafting this. In the kit boxes, you can find for example, new weapons or important pieces of armor. Super helpful is also the feature that gained Items will be released for each of your revolution fighters. Now, if one of your characters gets a weapon, then all characters can use it. - Farm money: To get more money, you can easily play missions on the easiest difficulty. This will get you a few dollars. - Keep map in sight: never stay too long out of sight, because it threatens you with advancing enemy groups. Of course, they will also provide you a comprehensive overview of the locations of your allies. - Wisely use explosions: It happens sometimes that you have many Molotov cocktails in your pocket. But you don’t have to merely throw them all at approaching vehicles or enemies. Instead, aim and through them then you can hit the fuel tank with a few shots. Thus, you can achieve the same effect and even save more ammunition. - Beacon: They appear in the game world now. Pay attention to it, because it shall lead you through the story and lead you to the next point. But they mark sometimes valuable loots. - Categories of weapons: Every weapon belongs to a particular category of weapons. But you can change the mode of your weapon at any time. For example: you have the possibility to use your assault rifle in a battle at short range. However, it is better use a sniper rifle in a different situation. - Car Mechanics: With this skill you can take everything apart and so plunder all sorts of objects, which in turn make you more loot. - Gangbanger: As Gangbanger you know exactly the communication, how to cope place on the streets of Philadelphia. So you taste abilities from the "survival" much less EP. - Gas Jockey: Using this skill you procure much more focus on your inventions, because you know, with what bite must feed to make the most out of them. This will also get your firebombs a much larger radius. It is highly essential that you carry enough weapons with you to survive and with the arsonists you get the talent to build their own incendiary. In addition, you should incidentally also always have some distraction explosives in a backpack. This can be critical to your tactics.